Six years ago, Liz Illg opened the first Puff & Fluff location in Phoenix, AZ. Today, we have FIVE locations across the Valley and we want you to know all about the dif-fur-rent services we offer! From pet grooming to pet sitting, Puff & Fluff is a full-service pet care business and our team members take great pride in their work. Below you can find more details about our services– and, of course, click around our site or give us a call to learn more! 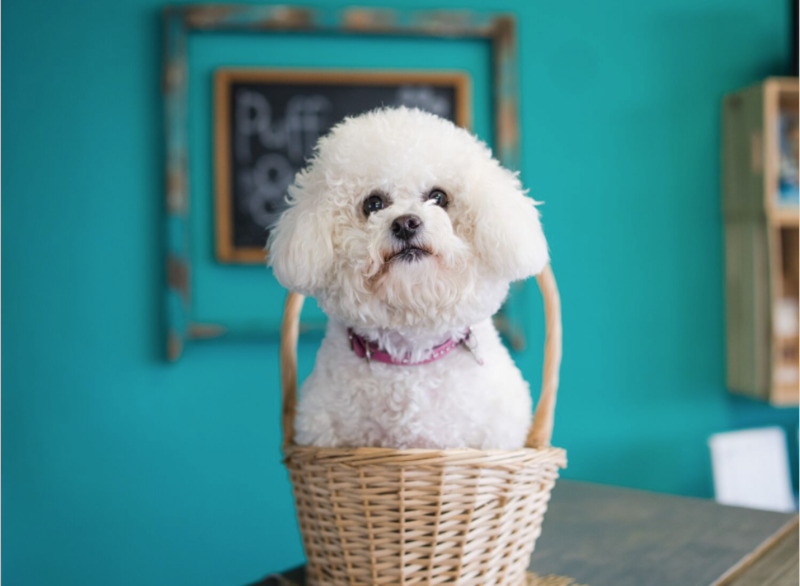 If your cat, dog, or bunny rabbit is in need of a nice shampoodle, Puff & Fluff is the place for you! We have five convenient locations that offer excellent grooming services. We offer flat rate services based on breed size, as well as à la carte specials. Our standard brush and bath includes a bath using hypo shampoo, followed by a blueberry facial, a massage, blow dry, nail care, glands, and an ear cleaning to top it off! Our team members are well-versed in pet care and behavior. If you have any questions or concerns about the products we use or the services we offer, we’re here to help! We also offer fun pet hairstyling, pet-safe nail color and pet-safe hair dyes as well. If you’re pup is a fashionista, she’ll love these unique paw-fferings! Puff & Fluff is more than just a grooming business, we offer pawesome pet sitting services as well! Whether you’re off on a vacation or just looking for care providers during the day, we’ve got you covered. We understand your worry and apprehension about finding the perfect person to watch your pet and we know that your pet deserves the very best! We help pet parents, like you, relax and enjoy their time away by providing excellent and attentive pet care. We stay in constant contact with you by sending updates via text, along with pictures, to let you know how your pets are doing. While you’re getting pampered on vacation, we’ll be pampering your pet with love and attention. In fact, we are the most trusted and responsible pet sitters in the Phoenix area. All of our pet Sitters are CPR Certified and Pet Aid Certified. Please note that we do charge an additional 20% for the following holidays: New Years, Easter, Memorial Day, Independence Day, Labor Day, Thanksgiving, and Christmas. Need more information? Send an email to petsitting@puffandfluffspa.com or give us a call at 602-708-3270. Please call or text for scheduling appointments for pet sitting or house sitting.